I’ve worked out after a month of no sugar that I can very easily get sick of chicken and salad. Having said that, I LIKE chicken and salad as long as I keep the flavours tasty and strong. I much prefer using chicken thighs over breasts for the juiciness and they are much more forgiving to cook. This recipe was last night’s dinner and then I had the leftovers for both breakfast and lunch today, and I still liked it (a lot), so I hope you do too! 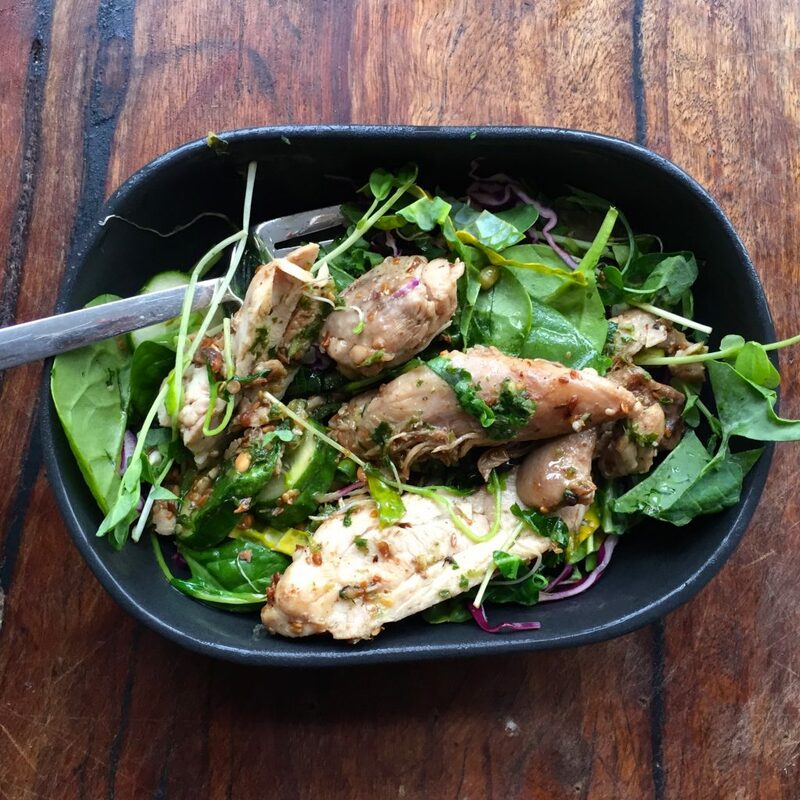 There is something appealing about a warm chicken salad that tastes delicious & healthy. I just emptied out my vegetable crisper and wanted to use up a whole lot of bits and pieces. I had quite a few different packets of sprouts I’d bought, so they feature strongly in this recipe! Quantities will depend on what you have, but it was a good combination of different greens, a splash of purple and the crunch from the sprouts. Toss all ingredients together. 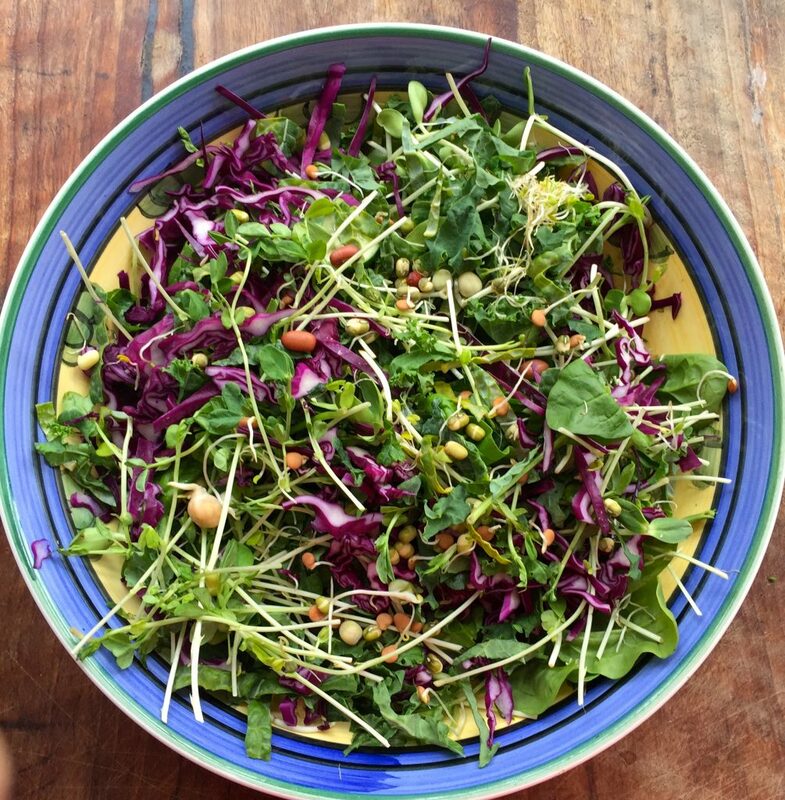 Serve with mixed herb dressing below or dressing of choice. spice mix of your choice – I used a smokey peri-peri one. 1-2 Tbsp ghee for cooking – or oil of your choice – perhaps macadamia oil. Put spice mix in a bowl. Place chicken thighs one at a time in the spice mix, flip over in the bowl to coat the chicken. Melt ghee in a heavy based pan. When hot put the thighs in the pan. Cook till browned on each side and cooked through. I find it helpful towards the end to put a lid on the pan to finish off the cooking a bit faster and keep it moist. Remove. Stand for 5 mins then slice thinly and serve over the salad. 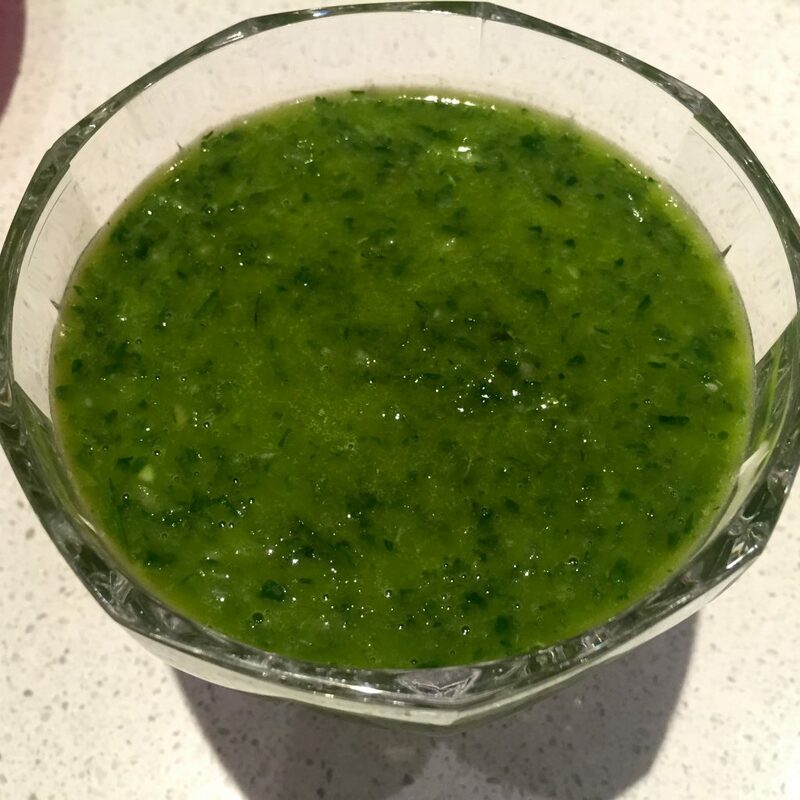 Like the very green salad, this dressing can vary depending on what herbs you have. I’ve made this quite a few times lately and this was the best version yet. Blitz the garlic and ginger in your blender/food processor/thermie (speed 7/3 sec). Add all the herbs & lemon juice and blitz again (Thermie speed 8/5 sec). Scrap down side of bowl and repeat if not finely chopped. If using a thermie, insert butterfly. Whilst your blitzer is running add another few tablespoons of olive oil (thermie speed 4/10sec or so). Check. If you want to thin it out, scrape down the sides and add a few tablespoons of water. Taste. Adjust with salt & pepper, oil & water to taste.